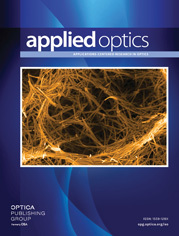 1The authors are with the Thin Film Technology Center and Institute of Optical Sciences, National Central University, Chung-Li 32001, Taiwan, China. C.-C. Lee's e-mail address is cclee@ios.ncu.edu.tw. The monitor passband width of an optical monitor is an important parameter for the fabrication of a dense-wavelength-division-multiplexing (DWDM) filter. The peak insertion loss and transmittance of one-cavity narrow-bandpass filters (NBPFs) were analyzed by using different passband widths. The simulation monitoring curves of the last layer of the first, second, third, and fourth cavities of a five-cavity DWDM filter with different monitor passband widths were investigated. The last layer of each cavity is very sensitive to the monitor passband width, showing that the monitor passband width of an optical monitor should be less than half the designed passband width. This analysis demonstrates the successful fabrication of a five-cavity DWDM filter.